North Korea has warned publicly for the first time that it is ready to develop nuclear weapons. A commentary carried by the official news agency in Pyongyang said it would build a nuclear deterrent to counter the threat from the United States, "unless the US gives up its hostile policy". North Korea said its aim in developing such weapons was not to blackmail others, but to reduce spending on conventional military forces and improve the lives of its people. Western intelligence agencies believe North Korea has had nuclear weapons programmes for several years and may already have a small number of bombs. Monday's statement was the closest North Korea has come to acknowledging the programme, and is being seen as part of its on-going attempts to win diplomatic and economic concessions from the US. The statement, carried by KCNA, said that, if the United States did not give up its "hostile policy", North Korea would have no choice but to opt for a nuclear deterrent. North Korea's administration has previously only made this threat privately while in talks with American officials, although it has repeatedly stressed that it maintains the right to a nuclear programme. However, it did hold out the prospect of a deal with Washington. It said that, if the United States gave up its hostile policies, the North would resolve its concerns about the nuclear programme. North Korea views Washington as "hostile" because, although the US has stressed that it wants a peaceful resolution to the crisis, there has been discussion of sanctions or even a naval blockade if diplomacy does not work. Washington has also not ruled out a military strike against a country it has labelled part of an "axis of evil". The US is currently trying to build a coalition of regional powers to help rein in North Korea's nuclear ambitions. The issue dominated talks this weekend between the leaders of Japan and South Korea. Junichiro Koizumi and Roh Moo-hyun agreed on the need for multilateral talks to seek a peaceful solution to North Korea's nuclear threat. North Korea is insisting on bilateral negotiations with the United States. But the two East Asian leaders demonstrated slightly different approaches, with Japan's prime minister voicing readiness to take action and Mr Roh emphasising dialogue. US Deputy Secretary of State Richard Armitage told Japanese Foreign Minister Yoriko Kawaguchi on Monday that Washington hoped Japan and South Korea would take part in multilateral talks on North Korea. 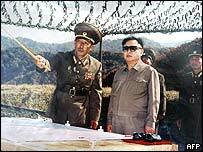 The US withdrew aid shipments under a 1994 deal designed to stop North Korea from developing nuclear arms. North Korea responded in December by withdrawing from the Nuclear Non-Proliferation Treaty. "The state agency said a nuclear deterrent was needed"